Parents know it, schools know, kids know it: reading is important! And it matters for everything. Reading doesn’t just mean you will be able to learn and do well in school, it also means you will be able to apply for a job, navigate the world around you, buy what you need, pay bills, and communicate with people remotely. However, if you have problems learning to read, you will also have issues with all of the things that require reading too. This can create a slippery slope when reading problems aren’t identified and addressed early on because reading struggles aren’t going to go away on their own. Although we are not born with an innate ability to read, we have structured our child rearing and education systems to set the foundation for learning to read from an early age, and, despite not being innate, our reading development is impacted by our genes, as well as our environments. A recent study by Erbeli and colleagues (2018) investigated how reading develops over time by examining the overlap of genetic and environmental influences on early kindergarten and first grade reading skills and later reading comprehension ability in 7th grade, using a sample of 724 twin pairs from the Florida Twin Project on Reading. The reason the researchers used twins for their analyses is because the genes and homes that twins have in common allow us to figure out how much of a certain skill, like reading, is due to genes and how much of that skill is due to environmental influences. Their main focus was to figure out which forces were at play before reading fully develops that continue to exist over time, and which new influences come on board as children learn more and become more advanced in their reading ability. Specifically, the early reading-related skills they measured were how quickly children could name letters and sound out the letters that make up a word in kindergarten and, in first grade, how quickly children could read whole words that were both made-up and real. Finally, in 7th grade, they measured children’s ability to understand what they read using full passages of connected text and multiple-choice and short- and long-answer questions. 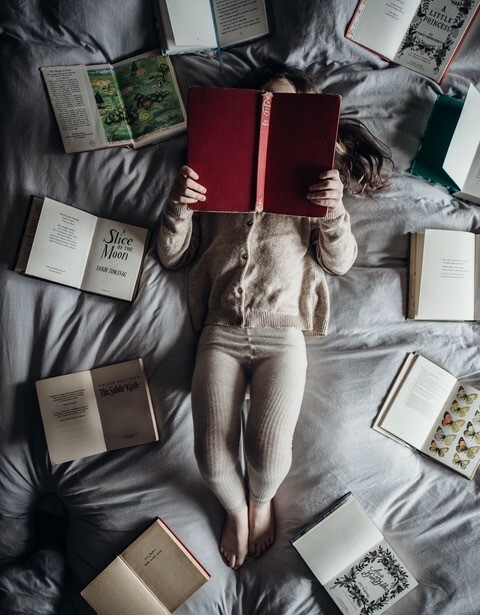 The researchers found that the same genes and shared environments are at play across children’s reading development, impacting their reading skills through kindergarten, 1st grade, and 7th grade. In other words, the same genes and home and school environmental factors that matter before children know how to read in kindergarten and 1st grade, continue to matter and stick around all the way through middle school when reading becomes more challenging. This supports the idea that kids that struggle with learning to read need early intervention from the very start of reading instruction, as well as continued support throughout their middle school reading careers. It also means that we should set up shared environments, like the home and school, that support children’s reading development through exposure to books and shared reading activities early on, even before children may know how to read, because those early reading experiences continue to have an impact in their ability to understand texts in middle school. For shared environmental influences, the researchers also found that there are no new influences coming online in 7th grade. All of the shared environmental influences that impact reading comprehension in 7th grade are coming from early in development, making it that much important to start setting up a reading-friendly environment early on with our kids. The researchers also found that some genetic influences among kindergarten, 1st and 7th grade reading-related skills were shared between just 1st and 7th grade, and also unique to each grade-level and skill measured. Thus, although children may have certain needs and abilities in kindergarten, they continue to develop additional needs and skills as the grow and undergo more reading instruction. As such, it is important to continuously keep track of and measure children’s reading skills, which are complex and fluid, much like children are, in order to make sure they are performing where they need to be as their reading develops. Overall, the results of this investigation highlighted the importance of early experiences with reading for shaping children’s reading development. We should create reading-friendly environments, with books, library trips, and shared reading activities even before children learn how to read because that exposure carries on into 7th grade. In addition, we should keep track of how children are doing in their reading development from kindergarten all the way through to middle school, because some new forces may come into play that change their needs for reading support, so frequent and continued assessment for reading is key. Erbeli, F., Hart, S. A., & Taylor, J. (2018). Longitudinal associations among reading-related skills and reading comprehension: A twin study. Child Development, 89(6), e480-e493.